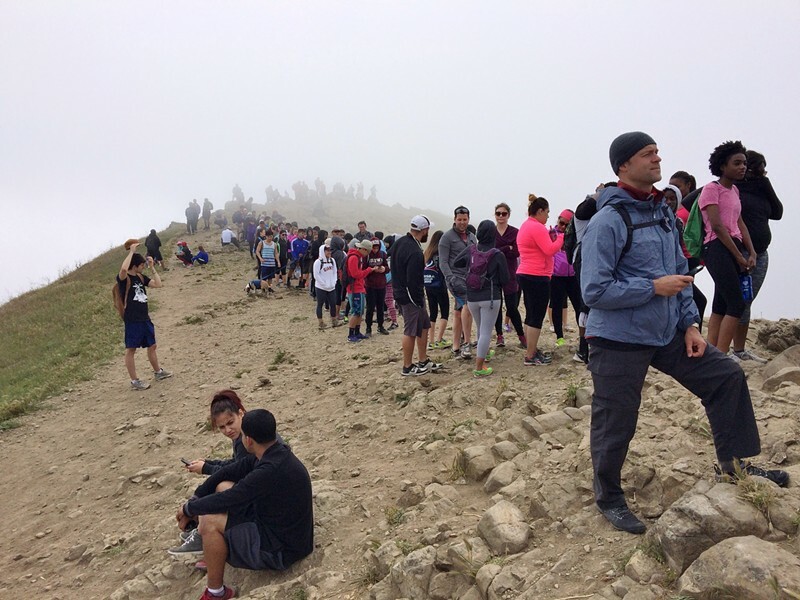 Hikers line up to take photos and selfies at the ever popular Mission Peak Regional Preserve summit in Fremont. In Fremont, the East Bay Regional Parks District is seeking to increase access to a trendy hiking trail by constructing a parking lot atop land sacred to the region's indigenous people. At a tense meeting late last month, some 75 Ohlone people and supporters filled the EBRPD’s chambers in south Oakland to decry plans for a 300-space parking lot at Mission Peak Regional Preserve in Fremont. The activists argue that numerous cultural and burial sites of the Chochenyo and Tamyen Ohlone are located at Mission Peak. They say Regional Parks staff has repeatedly dismissed objections to the location of the planned parking lot. Spurred by a fad of selfie-snapping atop Mission Peak — which offers a world-at-your feet view of Silicon Valley and San Francisco Bay — usage of the three-mile trail to the summit has grown exponentially in recent years. Residents near the Stanford Avenue access point have complained to EBRPD staff about the resulting parking glut in the streets in front of their homes. And while the Preserve already features a parking lot, some park users complain that the lack of available weekend parking has made access to their preferred trails too onerous. But the location slated for parking-lot construction, dubbed Option A in the project Environmental Impact Report, is a known archeological site that is eligible for the California Register of Historic Places. According to the EIR, construction could disturb cultural resources and "adversely affect Native American skeletal or cremated remains." Many speakers at the September 20 meeting questioned both the legality of the Regional Parks decision. They noted that the 2007 United Nations Declaration on the Rights of Indigenous People requires governments of signatory nations to obtain “free, prior, and informed consent” from tribal leadership for projects that impact indigenous cultural heritage. Parks District Public Information Supervisor Carolyn Jones said staff abided by state and federal laws, however. She also noted that Coyote Hills Regional Park features a re-creation of an Ohlone village, and that the District employs a staff person to serve as a liaison to the region's indigenous people. “Generally speaking, we work very closely with Ohlone people,” she said. Chochenyo Ohlone community leader Corrina Gould of Oakland said Ohlone leaders proposed several alternatives that the Parks District failed to consider. Gould and other native people say the Regional Parks District has a history of failing to take their concerns seriously. They also strongly opposed a 2012 decision to turn Brushy Peak near Livermore, the site of the Ohlone, Miwok, and Yokut origin stories, into a recreational facility. The District went ahead with the plan, anyway. In the past, the Ohlone people sought amendments to the EBRPD’s general plan to give them greater influence in the District's decision-making. Currently, the EBRPD offers them no more say than more standard interest groups, such as mountain bikers. . Though the parking lot EIR is now certified, construction is not slated until 2019. Ohlone descendants and their allies have vowed to continue fighting it. Elder Orta had regularly participated in the EBRPD’s annual Gathering of Ohlone Peoples — one of the District's most popular annual events — since its 1993 inception. She typically leads a demonstration of the traditional method to processing acorns into mush. Her daughter, granddaughter, and two of her great-granddaughters also typically lead demonstrations on Ohlone traditions. This year, Orta's entire 66-member family boycotted the gathering, because of the parking lot. Dozens of other indigenous people refused to participate, as well.